Tree owners are liable for any damage that their trees may cause and thus have to abide by the laws governing public safety. It is therefore necessary to have systematic tree inspections carried out. The aim of these regular “check-ups” is to assess the condition of individual trees and tree stock and to document everything in comprehensive fashion. A standard inspection is always carried out from the ground, and all examinations – whether one individual tree or a whole stand of trees – have to be conducted with the same precision. Only where the type of documentation of the results is concerned will there be differences. During a standard inspection, the tree is examined all the way from the top of its crown to its base. Equipment of any kind that is attached to the tree, including integrated crown support systems, also has to be visually inspected for proper function. If the tree shows any symptoms of decay or damage, these are checked on the spot using simple tools, such as a chisel. If abnormalities are detected, they are assessed and then documented using the GIS-assisted tree inventory software that we ourselves developed. Only if “suspicious circumstances” are apparent will treatment or further inspections be initiated. Which exmamination methods do Brudi & Partners use? How safe a tree is depends on biological factors (e.g. 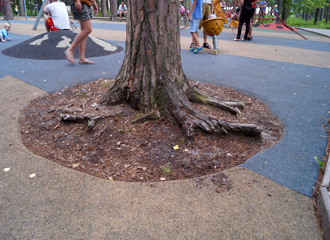 the tree’s vitality), the local environmental conditions that exist where the tree stands (e.g. 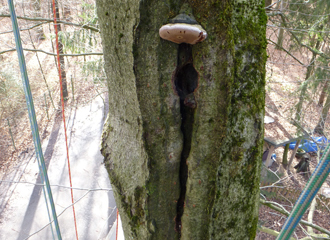 wind exposure), and the tree’s load-bearing capacity, which can be significantly affected by decay or cavities. Brudi & Partners favour the use of tree-preserving inspection methods that are based on the recognition of reactions between tree and disease. The combined application of tree biology, meteorology and mechanics can enable a holistic assessment of a tree’s load capacity and performance. This inspection procedure is known as the Statics-Integrated Assessment method (SIA method) and it is the foundation of our inspection methodology. Brudi & Partners do not use VTA (Visual Tree Assessment), a four-step inspection procedure that often ends in the use of instruments that will cause damage to the tree. Who does the tree inspections at Brudi & Partners? Our experts have many consecutive years of practical experience in the field of arboriculture and tree inspection. 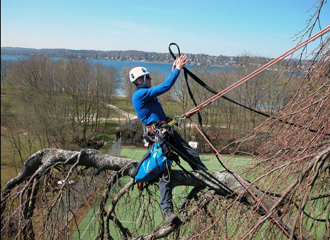 They are qualified or certified tree inspectors who regularly receive advanced, in-house training. If a diagnosis of tree damage cannot be concluded by the tree inspector, or if further safety-related technical examinations are requested by the contracting party, our company’s publicly appointed and certified expert witnesses are on hand to contribute their know-how. How can systematic tree checks be carried out, tree maintenance work coordinated, and costs calculated for municipal greenery? 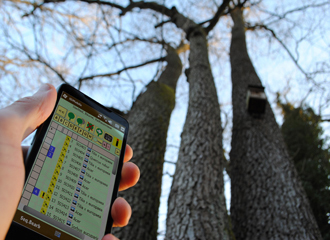 For a number of years many communities have been implementing systematic tree inventory surveys. This usually involves recording basic tree data, inspecting for potential safety risks, and entering recommendations into data-processing systems. 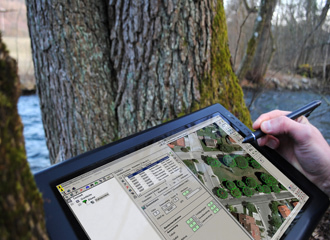 Many local councils recognize the advantages of having a cadastral tree inventory in their tree inspection documentation. However, their use of tree management systems for organizing and documenting operational processes is only secondary, even though these are the tasks that are becoming increasingly important. To record large tree inventories in an efficient and cost-effective fashion it is essential to have experience in operations management and advanced data-processing skills. Brudi & Partners have developed workflows which guarantee a high-quality database. In the initial recording stages, not only is the basic data entered but also the results of the visual tree inspections along with the recommended tree care measures. It often makes sense to include multimedia files (photos, film, documents). 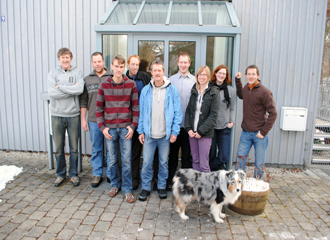 The workflows are all supported and documented by our specially developed iSiMAN software. 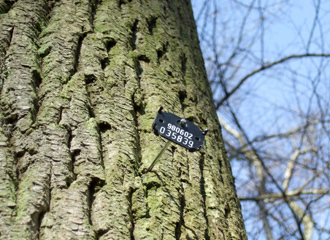 Attaching ID tags to the trees makes it easier for those responsible for tree management to locate certain trees in a particular area. We always use tree-friendly Arbo Tags, which “grow” with the tree. 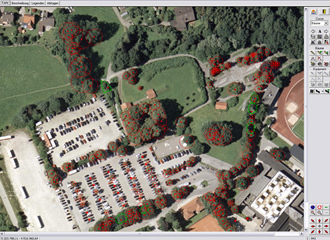 It also helps if the trees’ precise locations are mapped using RTK (Real Time Kinetic) precision GPS. How many people will be needed to carry out the tree work required in the coming year? Will it be necessary to contract out the work (lead times need to be observed for the calls for tenders)? How many trees have been lost and will conceivably have to be replaced? What condition is our tree stock in on the whole? How much is our municipal tree stock worth? If you do not have enough staff of your own to take care of tree maintenance, then you have to call in a contractor. 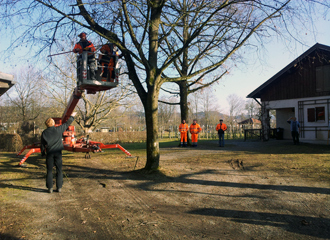 Brudi & Partners supervise the maintenance of tree stock on private and public properties. The services we offer, though these do not include tree maintenance itself, range from simple consultations to drafting legally compliant calls for tenders. We are also available to support and monitor the maintenance work as well as inspect it for acceptance. If our clients wish, we can record tree inventory in a cadastral database, regularly inspect the trees, and call for tenders for tree maintenance work. We can also provide support while the tree work is being carried out. In addition, we can apply to the authorities on behalf of our clients for the legal permits required, for example, for felling or reducing a tree’s height. Arboricultural work on old and valuable trees requires a lot of know-how. 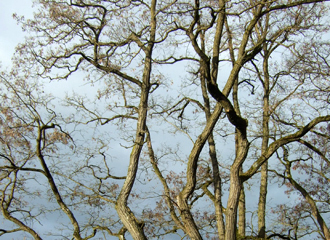 Even experienced arborists seek a second opinion from us in complex cases. During the tree inspection, the necessary arboricultural work is documented and prioritized. This information then appears in the work instructions for the tree worker or is used in calls for tenders. While the arboricultural work is being carried out, Brudi & Partners can take on its supervision. They can also carry out the final inspection and acceptance of the work in accordance with local regulations. If the habitats of protected species are destroyed, then the person who – legally speaking – could have prevented that damage can be held liable for it. That is what the law on environmental damage stipulates. Client and tree worker should therefore make sure, before any tree work begins, that the trees are inspected for any resident protected wildlife (e.g. cavity-nesting birds, bats, beetles, or other insects) and the status of their protection checked. Nationwide regulations must also be observed, which limit the pruning of trees during growing season. Brudi & Partners examine trees to determine whether they are inhabited by protected species or nesting birds. Our experts have the necessary knowledge of protected wildlife and use rope climbing techniques to reach every corner of the tree’s crown. We can help our clients acquire special authorization to prune or fell trees, or advise them on possible alternative or protective measures. Trees in residential areas increase the quality of life of the residents and also the value of real estate. Large and old trees are especially valuable in this regard. 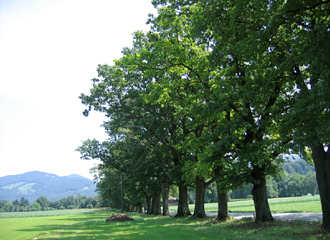 Every municipality therefore needs to maintain and develop its tree stock. We can support you with our expertise. We are seeing a drastic reduction in the number of tree species in the open countryside as a result of intensive land use. In towns and cities, urban forest – especially if it contains old and veteran trees – offers places of refuge that other endangered species need for survival. That is why tree stock in cities and towns needs to be protected and maintained, without question, for generations to come. Caring for and protecting urban trees is demanding, however: the increase in temperatures, above all in inner-city areas, as well as the influx of new pests, are leading to fresh challenges in the management of green areas. A new combination has to be found of tree species that are suited to the climate. Old trees, for their part, need to be given the best possible care, so that they cope with the stress that climate change is subjecting them to. 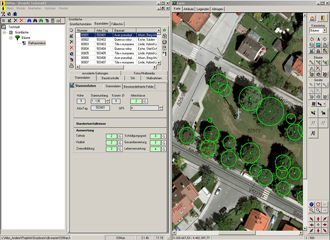 Large-scale tree development plans intended for long-term use in an urban forest have to be based on substantial data from extensive tree surveys and cadastral inventories. They also have to comply with legal standards and planning regulations. Not only is the short-term advice important but so too are the medium-term and long-term measures and goals, the focus of which is on long-lasting, effective tree greenery. Recommendations on how to deal with neophytes, and the description of scenarios and treatment procedures in calamitous situations (e.g. 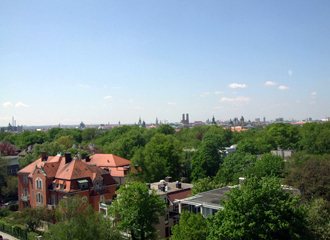 large-scale pest infestation) are further aspects which, along with cost-benefit analyses, CO2 balances and tree location balances, are all components of a development plan for urban tree stock. A maintenance and development plan in which the public participates and cooperates provides all those interested in community greenery, and all the groups involved in it, with a guideline on how to handle urban tree stock in the future.